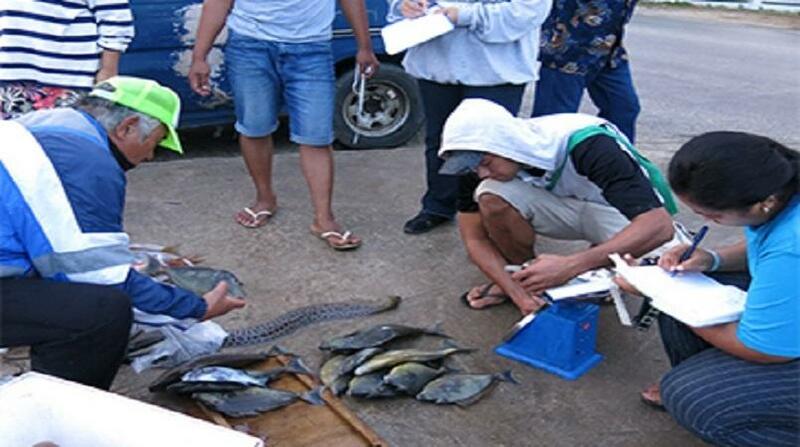 The Pacific Community (SPC) has released a new, comprehensive guide to common coastal food fish of the Pacific Islands to assist fisheries officers in identifying species during surveys of catches and at fish markets. Two years in the making, the waterproof identification guide contains approximately 320 of the most commonly targeted bony fish species, including emperors, groupers, snappers, parrotfish and surgeonfish, along with coastal sharks and rays. It was produced with funding support from the Australian Government and the European Union through the ‘Scientific Support for the Management of Coastal and Oceanic Fisheries in the Pacific Islands Region’ (SciCOFish) initiative. Copies of the guide will be distributed to fisheries agencies across the region. “Catches of coastal finfish in the Pacific region are typically characterised by a wide variety of species from many different taxonomic families,” SPC Coastal Fisheries Scientist and co-author of the guide, Dr Brad Moore, said. “Often even closely-related species exhibit vastly different life histories, particularly with respect to growth rates, maturity schedules and longevities, which mean they may have vastly different vulnerabilities to fishing pressure,” Dr Moore said. “Being able to accurately identify harvested species will improve reporting on catches, improving monitoring of coastal fisheries in the region and ultimately lead to more effective management,” Dr Moore said. Co-author and SPC graphic designer, Boris Colas, led the production of the colour illustrations and photos in the guide. In addition to a high-resolution photo, information on each species includes its scientific and common English names, a description of key identifying features, the species’ likely presence or absence from individual Pacific Island countries and territories, and, where relevant, notes on how to distinguish similar-looking species. As the guide is intended to aid fisheries officers identify species encountered during their catch or market surveys, it was considered important to include photos of dead fish (where possible), rather than in-water images, as these would be similar to the state and colours of fishes that officers will encounter during their surveys. The bulk of species photos for the identification guide were provided by renowned ichthyologist and fish photographer John Randall with additional images provided by researchers and amateur fish photographers from locations as far afield as Australia, Canada, Japan and the United States.